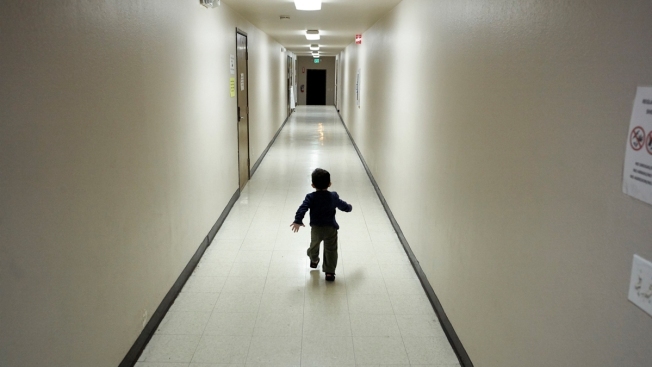 In this Dec. 11, 2018 file photo, an asylum-seeking boy from Central America runs down a hallway after arriving from an immigration detention center to a shelter in San Diego. Lawyers for eight immigrant families separated under Trump administration policy filed claims Monday, Feb. 11, 2019, against the U.S. government demanding $6 million each in damages for what they describe as lasting trauma. Eight immigrant families who were separated under Trump administration policy filed claims Monday seeking millions of dollars in damages for what a lawyer called "inexplicable cruelty" that did lasting damage to parents and children. In her claim, the Guatemalan woman alleges she was detained in May with her son in a type of temporary detention facility nicknamed a "hielera," or icebox in Spanish. The immigration officer who taunted her and three other women told them the law had changed, that their children would be taken away, and that they would be deported, the claim alleges.